2 channels each configurable as either digital input, or digital output. All data transfers are CRC16 error checked. Digital outputs, (A) sink 50-mA., (B) sink 8-mA. Digital inputs are latched until read. CAT-5 twisted pair up to 1000 Feet, 100 devices. The D2, 2 channel digital I/O expansion card, provides two I/O channels which can individually be configured as a digital input with latch or a high current sink digital output. Digital input and output functions can coexist. The D2 has a built-in multidrop controller (DS2406) which provides a unique 64 bit registration number (8-bit family code + 48 bit serial number + 8 bit CRC) assuring error-free selection and absolute identity; no two parts are alike. Unique addressing allows I/O function to be identified absolutely, no more dip switch address confusion. Status input, latched-input-activity and output-latch functions allow input, output and fast event catch functionality to hundreds of I/O points on a 1-Wire bus. The DS2406 provides the digital I/O functions. 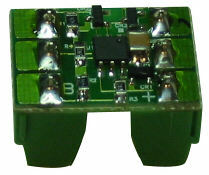 The I/O connector is marked "A" I/O position one, "G" common ground returns, "B" I/O position two. 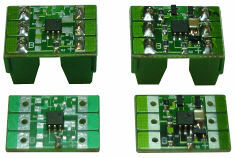 The D2 is designed to allow a network of input and output modules to operate on a two or three wire bus, power("+"), common("G") and data("D"). The D2 can be powered locally or the power may be bussed with the 1-Wire signal in a three wire system. 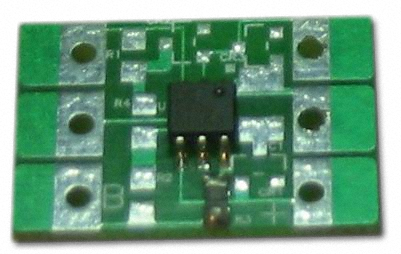 The bussed power must be regulated 5V. The D2 is compatible with EDS' OW-SERVER as well as any 1-Wire host with support for the Maxim Integrated's DS2406 Dual Addressable Switch.